Greetings Gentle Readers! How is your spring progressing? Ours is ok at the moment. We were, again, up and out early for a restorative hike in the desert. One scans for rattlesnakes and hopes for the best. Generally we believe they can tell from the amount of vibration we're making that we're too big to eat. In all of our years here, we've only had one challenge us on the trail. It was a nice morning to be out and about. If you look about dead center, you can see a black dot. That's one of a group of ravens that were riding the thermals and enjoying the day. They are such good flyers. They'll go up, and then slip sideways. We just love watching them. After a bit, they moved away from the mountain so we could see them better. This is the skeleton of a dead saguaro. He's been like that for quite awhile. Eventually he'll fall down. After lunch I went over the wall and picked up construction debris that a previous owner had decided to pitch in the wash, rather than disposing of it properly. When I was done with that, Jim decided to move some of the agave bits down the hill and take them out. After being stabbed three times by the incredibly sharp tips of the agave, he decided perhaps he would wait until removal had occurred. This is the spike. The top part that broke off weighs about five pounds. It's no wonder the base was pulled over. It wasn't due to agave snout weevils - the roots were not up to the task. This is the source of tequila. They cut the leaves off, press the juice out of the main ball of the plant and ferment. The ball is amazingly heavy, it's full of water and fiber. Two and a half hours later after the landscaper arrived, we were left with this. I can not believe one man, working alone, was able to complete that task. It would have taken us weeks; and then there is the dreaded issue of disposal. Jim and I trimmed the big agave next to the driveway. Using google translate, I got the words to ask could I put the leaves in his truck. Apparently my Spanish accent is even more abysmal than I thought it was. Anyway, at least he knew I had tried to ask for permission to put a few leaves in the back. So a hike and bank maintenance were the activities for the day. Soon there will be another cactus post. I'm saving them up for maximum impact. As we suspected, the agave producing the flower spike was sick, agave snout weevils would be my first thought. During the night, the weight of the spike pulled the entire plant over. We're going to have to get someone in to remove this. 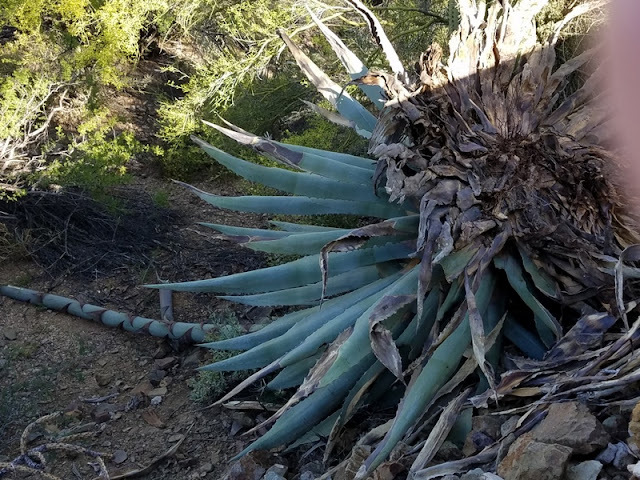 Farewell to thee, old ancient agave! In happier news, the ocotillo is finally blooming. It's windy and HOT. Yesterday it hit 98. We figured after a terrible winter, that the climate would quickly jump to being really hot. It did. Yesterday we went to the gym. I'm starting to like it again. It takes awhile to get back in to it; one has to decide which machines are good and how much weight to use. Thursday we got the Mumps, Measles and Rubella vaccine. It's a live virus and makes some people feel bad. After my response to the Prevnar 13 shot I figured it would be me, but nope - Jim felt bad on Friday. Going to the gym actually helped, so that was good. It was interesting, the pharmacist at Costco did not want to give us the vaccine. Apparently the CDC has issued a statement that if you're old, you're immune. I happen to know I do not have immunity to rubella because my immunity titre was run in the past. I also know I've never had mumps. So, how then, if I did not have the illnesses, did I develop immunity? The pharmacist said that would be a good question for the CDC. We got the shot. After seeing a 60 year old rabbi on NBC news talking about how his one measles vaccine was not enough to give him permanent immunity (current standard is two), and he and 20 people in his synagogue contracted it, and some are now deaf and some are blind, we decided just to get the shot. We spend summers in Washington which has a higher than expected failure to immunize. Today we were up and out early for a restorative walk in the desert. We saw two snakes, two rabbits and three deer. 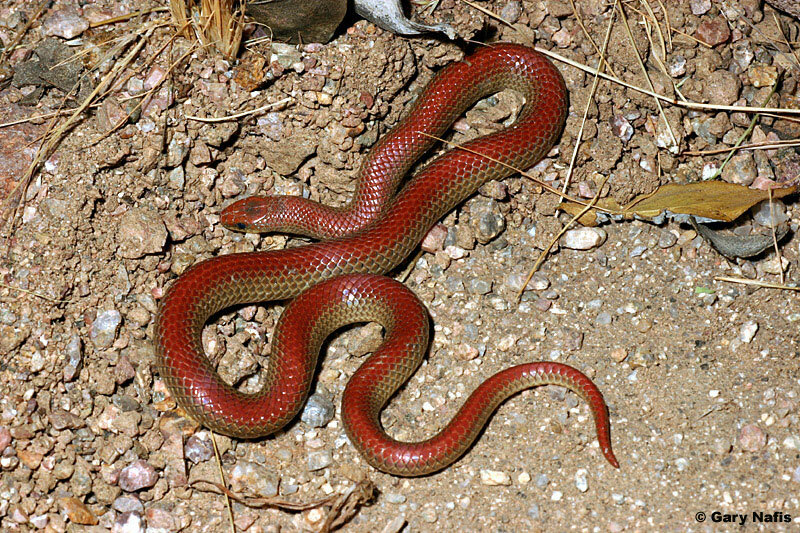 The first snake was a small brown one. It scared the snot out of me crossing the trail right in front of my foot. The second one was stretched out across the trail not moving. He had his head up, so we knew he was awake. I bowled a rock in his direction, and he took off. 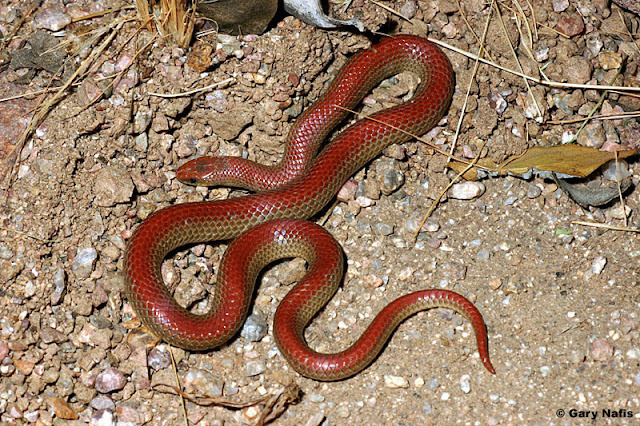 It's a Groundsnake, they're not venomous. But they still give me the willies. Photo is courtesy of the internet. The cactus bloom continues. I like the ocotillo arch over the trail. The buckhorns and staghorns are starting to pop. They have a really pretty blossom for such an unattractive plant. The lizard was in the front yard today. We were concerned that the wretched road runner might have eaten him, but there he is. It's a terrible picture, too short of a lens shot through the blinds. This isn't much better, point and shoot with a lot of zoom. That's it - I have nothing really interesting to report. Yesterday we found a new trail. It's a better route back to the trail that goes to our house from the trail that goes to the big wash. We found it on the far end, and today walked it again so we'd be able to find it. This will start out as a very boring post for all of you. There will be more interesting stuff later. The trail branches about 12 to 15 feet from the intersection of the trail that goes to the water tower and the trail that goes back to the house. Jim built a cairn for the far end of the trail where it intersects with the trail that goes to the big wash. The trail continues on towards the big rocks. This is the marker on one side of the trail, and the cairn marks the other side. The permanent marker for when it's time to turn off the trail that goes down to the big wash is when the water tower becomes visible 90 degrees to the trail. Cairns and rocks are not permanent, the water tower is. There are cactus blooming. This is a hedge hog. I have no idea why it's called that. They have the most incredible purple blossoms. There are yellow prickly pears. This is going to have a lot of flowers. This is a teeny tiny cactus. I found it living in total darkness under a bougainvillea. It used to have another section, but it fell off after I moved it. It's maybe 1/2 inch tall. It appears that it's putting out two little sections from the top. Cactus are really tenacious. I did go out and straighten him up a little. Look at the center of the photo. That's a rabbit down in the wash. We could see him because he was wiggling his ears. The Javelina have worn game trails in the wash. It makes it much easier to walk around there. The agave flower spike is continuing to grow. Mary Moon linked to a really good article on the death of the dinosaurs. It's well worth a read, and can be found here. You will learn much. That's it! That's all I've got! Trails, cactus, a rabbit and the KT layer.